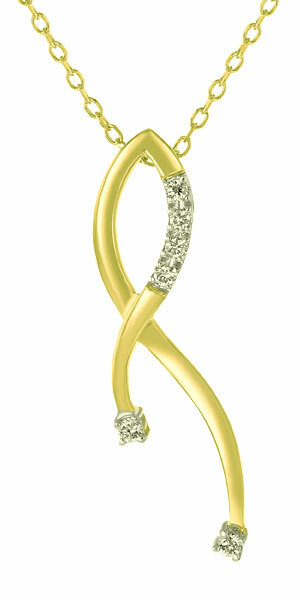 This is a limited edition gorgeous ribbon pendant that has been designed exclusively for WPH. Price $899 marked down to $599! It is beautifully crafted in 14K high polished Pink Gold and set with .15ct round brilliant cut diamonds. It it also available in White or Yellow gold. Accented beautifully on the twist with 4 bead set diamonds with rhodium, that weigh .08ct and two larger prong set diamonds that sparkle in the tips and weigh .07ct. The total diamond weight is .15cttw and the diamond grade is Ave SI2, I1 in clarity and H-I color. This pendant is .39” wide and 1.41” in length and is paired on a 14K Pink Gold cable link chain with a spring ring clasp with a total gold weight of 3.0gr. All diamonds are ethically sourced and are in agreement with the Kimberly Agreement. Each pendant comes with a certificate. This ribbion is hand made to order, please allow 4 weeks for delivery. Get the lowest price on OA Ribbon 14K Pink Gold Diamond Ribbon Pendant - Breast Cancer Awareness Jewelry. We are dedicated to always offering the best service and value to our customers. We will match the price, at the time of purchase or until 7 days after your purchase, on a Price Match Guarantee product if you find the same item ( OA Ribbon) at a lower price at a Designated Major Online Retailer or at a local retail competitor's store in the US.